Director-General for International Cooperation and Development in the European Commission Stefano Manservisi shakes hands with Prime Minister the Hon. Dr. Timothy Harris. BASSETERRE, St. Kitts – St. Kitts and Nevis’ Prime Minister the Honourable Dr. Timothy Harris has outlined various concerns the federation has with respect to the recent listing of the twin-island federation as a non-cooperative tax jurisdiction by the European Union. On March 26, Prime Minister Harris expressed concerns of fairness, deadlines and economical impact during a meeting with a high-level European Union mission led by Director-General for International Cooperation and Development in the European Commission Stefano Manservisi. Hazel further noted that the language as it relates to the requirements outlined by the EU is often difficult to interpret and understand, and as a result, creates a stumbling block. She also agreed with the summation by Prime Minister Harris that these decisions to list countries like St. Kitts and Nevis, which remain committed to international standards on transparency and exchange of information for tax purposes, pose significant challenges for the country’s economy. 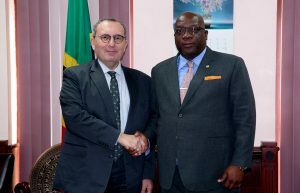 Manservisi acknowledged the concerns expressed and called for continued dialogue between small island states like St. Kitts and Nevis, the European Union and its partners. Hazel stated in a national address March 13 that St. Kitts and Nevis is a committed and fully cooperative jurisdiction in the context of international tax transparency.